1. Southern Hospitality (Curtis Lee Walker & Cassius Cutcher) defeated the Kovac Brothers (Matt & Michael). 2. “Inferno” Johnny Adams vs. Superbeast ended in a double count-out. 3. Bigger & Badder (Brett Mednik & Chance Taylor) defeated Jimmy Andrews & David Evans. 4. Tommy Mandrake defeated Danny Danger. 5. Freddie Midnight defeated Pepper Parks by DQ. 6. Survivor Elmination Match: Dalton Castle, Mike Radski, Brandon Thurston & Jonny Puma defeated Cade Cassidy, Tommy Caliber, “Mastiff” Will Calrissian & Chris Cooper. 7. Primal Warpath defeated Colonel Confederate. 8. ESW Heavyweight Title Match: Kevin Grace defeated Ryot by DQ. -After the match, Grace challenged Ryot to a casket match for the title on February 27th. 2. Ryot vs. Warpath ended in a double count-out. 3. Brett Mednik beat Tommy Mandrake. 4. ESW Tag Team Title Match: Famous (Will Calrissian & Chris Cooper) beat the Kovac Brothers (Matt & Mike) to retain. 5. Freddie Midnight beat Curtis Lee Walker. 6. “Inferno” Johnny Adams beat Jonny Puma in a No-DQ match. 1. Brett Mednik defeated Curtis Lee Walker. 2. Cade Cassidy defeated TKO. 3. Freddie Midnight and Pepper Parks was ruled a no contest. 4. ESW Tag Team Title Match: Mike Radski & Brandon Thurston defeated Famous (Chris Cooper & “Mastiff” Will Calrissian) when Thurston submitted Mastiff to win the title. 5. Jonny Puma defeated Tommy Caliber. -Caliber was attacked after the match by his tag team partner Cade Cassidy and bodyguard Mean Mike. 6. Superbeast & Tommy Mandrake defeated Danny Danger & “Inferno” Johnny Adams when Superbeast pinned Danger. 7. Warpath defeated Matt Demorest. 8. 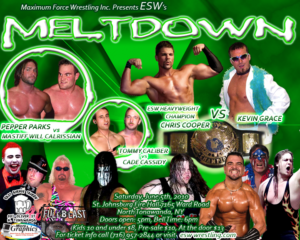 ESW Heavyweight Title – Casket Match: Kevin Grace defeated Ryot to retain the title. 1. Chris Cooper beat Tommy Caliber. 2. Superbeast & Tommy Mandrake beat Jimmy Andrews & David Evans. 3. “Inferno” Johnny Adams beat Freddie Midnight by disqualification. 4. Ryot vs. Purple Rain ended in a double count-out. 5. ESW Tag Team Title Match: Mike Radski & Brandon Thurston beat the Kovac Brothers (Matt & Michael) to retain. 6. Brett Mednik beat “Superbad” Richard Venice. 7. Shade beat Jonny Puma. 1. Freddie Midnight & Barry Hardy defeated Pepper Parks & Dalton Castle. 2. Primal Warpath defeated Michael Kovac. 3. Tommy Mandrake defeated Curtis Lee Walker. 4. Jonny Puma defeated Brodie Lee. 5. Strap Match: “Inferno” Johnny Adams defeated Superbeast. 7. 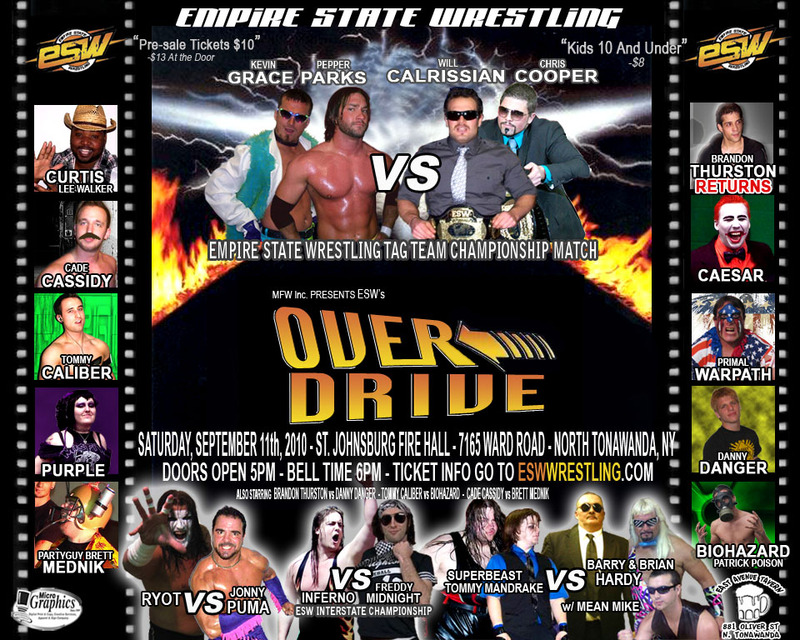 ESW heavyweight title match: Chris Cooper defeated Kevin Grace to become the new champion. A crowd of close to 700 were treated to some of Empire State Wrestling’s most memorable moments, including surprise guests, Kevin Grace and Gabe Saint’s four-star match, Brutus “The Barber” Beefcake cutting off Mastiff’s mullet and Puma’s superfly splash from the top of the steel cage. 1. Pepper Parks beat Freddie Midnight. 2. “Bad Boy” Barry Hardy & Brian Hardy w/ Mean Mike beat Hellcat & Coconut Jones. 3. Ryot w/ Caesar beat Brett Mednik. 4. The Bone Crushers & Warpath beat Superbad, Rob 2 Sweet & DewDust. 5. Kevin Grace vs Gabreal Saint was a draw. 6. Battle Royal for the new Interstate Champion winner was Johnny Adams. 7. Mullet vs. Mullet Match: Brutus “The Barber” Beefcake beat “Mastiff” Will Calrissian. 8. ESW heavyweight title – Steel Cage Match: Chris Cooper beat Jonny Puma to retain. -Before the matches started, it was announced that Chris Cooper & Mastiff were again the new Tag-Team Champions due to Mike Radski & Brandon Thurston not being able to defend them. 1. Danny Danger beat Josh Thor. 2. Jonny Puma, Barry Hardy, & Brian Hardy beat Superbeast, Tommy Mandrake, & The Caesar. Puma gave Caesar a wedgie after the match. 3. Brett Mednik beat Jordan Casey. 4. ESW Interstate Champion Johnny Adams beat Chance Taylor to retain the title. 5. The Bonecrushers beat The Kovacs. 6. Pepper Parks beat “Mastiff” Will Calrissian. The end came when Kevin Grace brought out a birthday cake (it was both Grace and Parks’ birthdays) and Parks smashed Mastff with the cake. -Right after intermission, Jonny Puma did a tribute for ring announcer Jordan Olivencia, who was announcing his final show. However, The Caesar and Ryot came out and ruined the festivities and Ryot destroyed Puma. 7. Tommy Caliber beat Cade Cassidy by DQ after Cassidy refused to release a choke. 8. Curtis Lee Walker beat James Santel. 9. 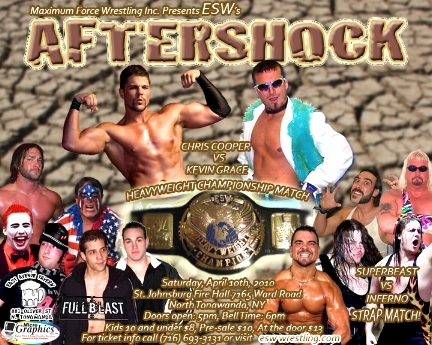 ESW Heavyweight Champion Chris Cooper beat Kevin Grace to retain the title. Calrissian held Grace’s legs down during the pin. Pepper Parks came out for the save. 1. Warpath beat the Sheik by pinfall. 2. Tommy Caliber beat “Biohazard” Patrick Poison by pinfall. 3. Superbeast & Tommy Mandrake beat Dalton Castle & “Bad Boy” Barry Hardy by pinfall. -Hardy turned on Dalton Castle during the match. 4. ESW Interstate Title Match: “Inferno” Johnny Adams beat Freddie Midnight by DQ to retain the title. -Barry Hardy attacked “Inferno” Johnny Adams with a chair to end the match. 5. “Party Guy” Brett Mednik & the All-Knighters (Joey Knight & Robin Knightwing) beat Cade Cassidy & the Young and the Wrestlers (Nick Ando & Superbad) by pinfall. 6. Brandon Thurston beat Danny Danger by pinfall. 7. Ryot beat Jonny Puma by count-out. 8. ESW Tag Team Title Match: Pepper Parks & Kevin Grace beat Will Calrissian & Chris Cooper by pinfall to become new champions. 1. Will Calrissian beat Maximo Suave. 2. Freddie Midnight (w/ Lady La La) beat “Biohazard” Patrick Poison. 3. Brett Mednik beat Dewpath by DQ. 4. ESW Interstate Title Match: “Inferno” Johnny Adams beat Danny Danger to retain the title. 5. ESW Tag Team Title Match: Pepper Parks & Kevin Grace beat Tommy Mandrake & Superbeast (w/ Caesar) to retain the title. 6. Ryot beat Jonny Puma by DQ. 7. Rochester Recking Crew (Hellcat & Rob Sweet) beat Fast and Furious (James Santel & Tommy Caliber) and Southern Hospitality (Curtis Lee Walker & Cassius Cutcher). -Caliber pinned Walker to eliminate Southern Hospitality. -Hellcat pinned Caliber to eliminate Fast and Furious. 8. 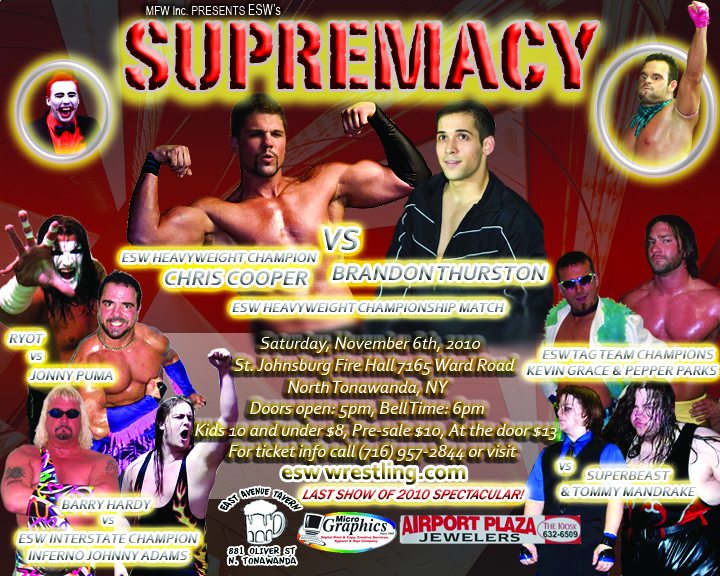 ESW Heavyweight Title Match: Chris Cooper beat Brandon Thurston to retain the title. -As Thurston applied the armbar on Cooper, Olsen entered the ring and kicked Thurston in the head, allowing Cooper to retain and become the first man in two years to pin Brandon Thurston.